04.15 - Alarm goes off. This hurts. 04.20 - The dog is extremely over excited about a sure thing imminent walk. How wrong he can be. 04.30 - We're both in the car. It's pitch dark outside and raining. The dog is not with us (he gets picked up for two great walks later from 2 x different aunts during the day, in case anyone is concerned about possible doggy neglect). 06.20 - Flight to Geneva takes off. 08.50 - Plane lands in Geneva. Hurrah for hand luggage only (a handbag only in fact - this is travelling super light). 09.20 - Pick up hire car and set off for Morzine. 10.25 - Call from builder that man from EDF Energy is there and wants to cut our electricity off, and could we hurry up and please stop him. 10.30 - Arrive at chalet. Man from EDF Energy has already left, helpfully leaving behind a calling card to say that unless we sort out unpaid bills and the right name on the account they'll cut us off within 48 hours. And it will take 2 months admin to connect us again. Frustratingly we (of course!) have been paying electricity bills all along, which arrive addressed to us. We have a contract, and it is in our name. Who knows what this particular spanner means or where it has come from. Which is par for the course. 10.30 - 13.00 - Work through the following To Do list: bathroom tiling placement, bathroom mirror placement, measurement of all windows (for imminent curtain ordering), discussion and decisions of boot room heating and electrics, measurement of dining table space for table sizing, tiling checking (batch numbers), entrance mat discussion, establish fireplace position, various lighting discussions, velux window unit number found and photographed (for blind ordering - who knew), discussion of outside area and pathway, discussion about extractor fan (master bathroom fan might not fit - so will have to order another potentially). Also take time to admire new cladding, and also new balcony. The blue floor colour is rubber water proofing throughout the whole of the top floor, so that if, god forbid, there should be a leak, it won't go through to the floor below. Still means no one is allowed to leave the bath running though. Also manage to grab 5 minutes with lovely neighbour to catch up on what's what. And thank her for letting us store the appliances and electrics in her garage. 13.00 - Drive into town to find a lunch sandwich. Nowhere is open. Stop at Rhodos for their 'quickest' food option, which turns out to be a surprisingly tasty lasagne and excellent salad. All in 5 mins. Impressive. Wolf it down in mere minutes without taking a breath. Ow. 13.30 - Drive to Voiron, builder's merchants in town. This is to source 2 x concrete boxes to house the WiFi cables as per France Telecom's instructions last week. There is some confusion over which boxes they have to be. This is actually very important, because France Telecom have been to our property SIX TIMES so far, and we still have no internet. Which frankly is mind boggling and utterly baffling. So if we get the wrong thing they'll use it as another excuse to go away again without fitting anything…it turns out that the FT approved boxes are not only NOT in stock (and will only come in next week - further delaying the whole blinking thing by another 2 weeks until we can go out again and install them), but they cost €160. Each. So we buy two other boxes that are pretty much exactly the same. And will do the same job. And are €46. For both. All fingers crossed that these get accepted as good enough so we can finally get that elusive internet. Or else there is end of tether in sight. 15.30 - Say a very sadly far too brief hello to lovely neighbours, who feed us welcome necessary tea. 15.45 - Leave FAR too late for airport, given our flight takes off in 2 actual hours' time, and it takes over an hour to get to the airport, we need to drop the rental car off and fill it up with petrol and we're driving into the teeth of Swiss rush hour. Eek. 16.00 - 17.10 - We ignore this totally stressful deadline, and concentrate on sorting out the EDF issue, which after all could mean we have no electricity for the next 2 months. Call helpful estate agent who did chalet deal, and sorted out name transfer with EDF initially. Send over proof of payment for last 8 months. Fingers are firmly crossed. 17.15 - Arrive at Geneva Airport. Our flight is already boarding as we walk through sliding doors. We run through the airport like maniacs. Make it through security (only because a lovely French family let us go in front of them sensing extreme desperation), and then passport control, puffing and panting and extremely hot. Arrive at the gate right at the end of the queue. 17.30 - Sit on plane. Get email to confirm that EDF won't be cutting us off tomorrow. This is due to the fact that they've accounted us to the wrong property. So we've therefore I guess been paying someone else's bills? It's not explained whose though, and we are assured that this is now all sorted. 17.50 - Flight takes off. 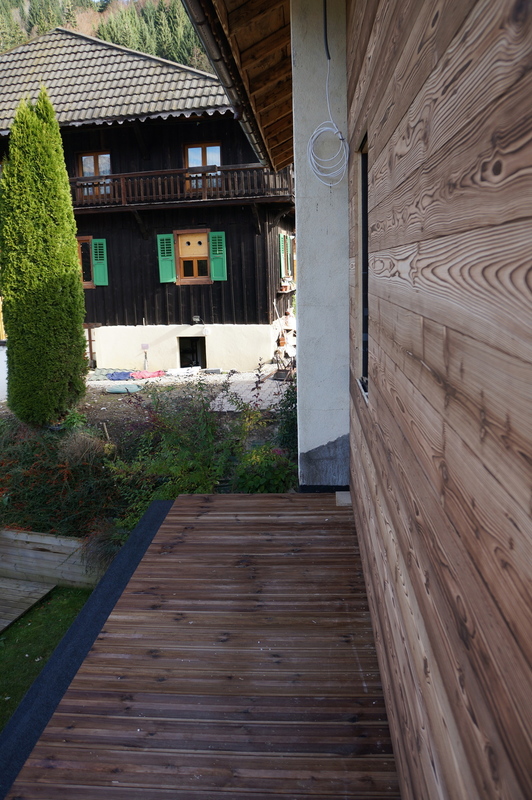 Look at photos of the chalet, as today has passed in somewhat of a blur. Remind ourselves of what progress has taken place since last visit. 18.20 - Flight lands at Luton. 19.25 - Arrive home. Pick up dog from aunt (his not ours) down the road, and order fish and chip takeaway with mega extra vinegar. Entirely forget it's actual Halloween, and therefore have no sweets or anything good for the small witches and wizards ringing the bell. Apparently handing them the latest gruesome and graphic crime novel from work won't cut it (but it's VERY Halloween, surely? ), and isn't age appropriate. Hide with curtains drawn and write this instead. Also drink wine. Sorry kids - but it's been a VERY long day. Better luck next year. To Sum Up: 5 hours to get there. 5 hours actually there. 4.5 hours back (more by luck than judgement). Back to (other) work in the morning. Tagged with France vs England, Morzin, Chalet, Renovation, Self Catering, Luxury. October 31, 2013 by Katya Shipster.